Have you ever had a haircut and come away unhappy with the results because your stylist didn’t understand what you wanted? Consider how much more difficult it can be for your pet’s stylist to give “Fido” that perfect look. “Fido” cannot offer feedback during the grooming process to let the stylist know if the length and style is what his owners had in mind. Owners have different needs and expectations about their dog’s grooming. We also have different perceptions of what certain styling words mean. Those differences in understanding can lead to unhappy results. Good communication is the key to having a successful relationship with your pet’s stylist. Ensuring that your pet is groomed just the way you want it done requires a little time and preparation. Unless your pet is a regular and frequent client don’t expect the groomer to know what you want. 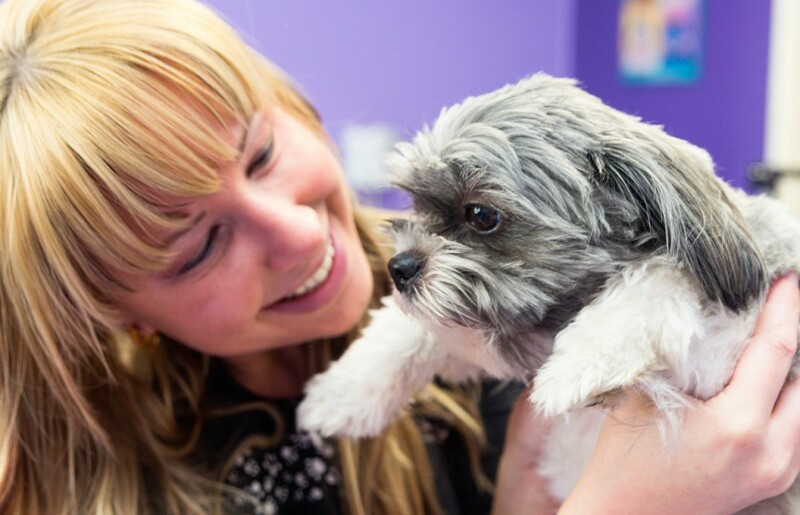 On your pet’s first visit with a groomer, allow extra time to discuss your pet’s needs and your preferences. If you want your pet’s hair cut to a certain length, say so. It is not enough to ask for “a short cut”–to some people that means two inches of hair, while to others a half-inch is too long. That fancy show cut may look appealing, but are you prepared for the at-home grooming routine needed to maintain it? A good groomer can help you decide on an appropriate style and length. Behavior and temperament of a dog is an important factor in deciding on a style. Extravagant styles are not suitable for fidgety dogs. Let your groomer know upfront whether your pet will be cooperative or a challenge. If your pet has not be brushed/combed regularly at home and the hair is badly matted, you may have to compromise. Sometimes it is impossible to save a matted coat. Your groomer can advise you if the humane approach is to clip underneath the mats and wait for the hair to grow back before trying a new style. Quality dog grooming takes time. While a human stylist can complete 3-4 haircuts per hour, a dog groomer may work two or more hours on one dog. Plan for your dog to be at the groomer’s for at least 1-3 hours. If you don’t like the results, let the groomer know. 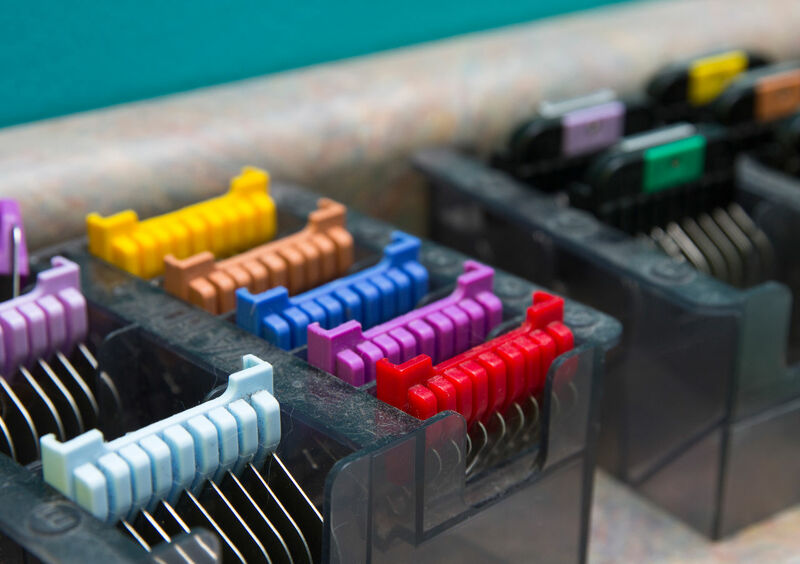 A good groomer will keep detailed records on the length and style and will add your comments to the file. Over time, with good communication, you and your groomer will be able to find the perfect style for your pet. Grooming for your pup should start at about 10-12 weeks of age (after second vaccination), to let the pup become acquainted with the sounds in the shop environment. This first grooming is acquainting the pup with the grooming table, gentle brushing, nail trim, bath and dry and some trimming around the eyes if needed, trimming around the paws and a sanitary. It is important to start them early. We recommend the next grooming at 4 months of age. Once your pup is conditioned for grooming, regular grooming is recommended every 8 weeks. Some dogs itch as people would after they have shaved their legs. Another reason is if the dog came into the shop matted to the skin, and the groomer had to use a very short blade to get under that matting to be able to lift it away from the skin. 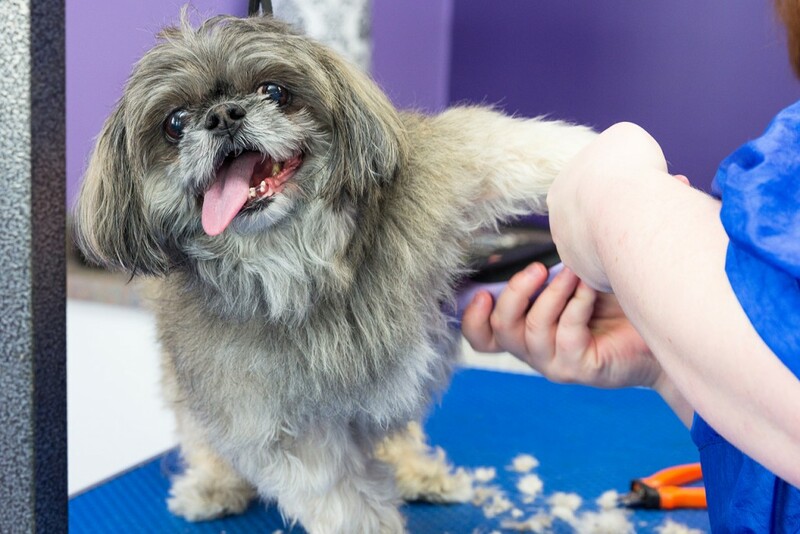 Owners are responsible for the regular in home brushing and combing of their pets to maintain their coats so a dog groomer can do a cute clip. Sometimes puppies will itch after their first grooming, or they have never had certain procedures done on them such as ear hair removal in the canal. Your pup will shake its head. Discourage your dog from scratching or shaking its head, as he or she will cause irritation and scabbing if left unattended. Also, white or light colored dogs are more prone to scratching and ear shaking after grooming. This will usually subside by the next day. If not it wouldn’t be a bad idea to purchase a cone from your local pet store or veterinarian so the pet cannot reach the skin sensitive areas to scratch. Shaving and clipping are the same. Blades come in all different lengths, from short too long. The longest blade made now is 2”. The better maintained the coat is, with no matting or knots and tangles, the longer clip style a groomer can do. Longer clipped styles require more frequent grooming every 4-6 weeks to maintain the style. Anything longer than that is hand scissored. If you enjoy the long styles and can afford the regular frequent grooming (every 4-6 weeks for hand scissored long styles) and are willing to put your time and effort into your pets brushing and combing, a long coat style is a site to behold. We do not use heat dryers on the pets in our care. Each pet is individually hand dried. Many pet owners neglect to have their pets groomed in the winter. Why? Mostly what I hear is, “it’s too cold”. It may be cold, but our pets still need professional grooming. Of course they can be left longer, even not trimmed at all during the cold months”. But they always need a complete brush and comb out and bathing that a professional can provide. Nail trimming and ear cleaning is a must all year round too. When clients let their pet go through the winter without professional grooming, their dog ends up coming in with their fur all matted, and then they need to be clipped very short. If you would like to keep your pet’s style, don’t skip those winter visits to the professionals’. Keep your pet in style and feeling great all through the year! Before going to the groomers, do NOT feed your dog. Take your dog for a walk prior to leaving home for him/her to relieve itself. Please DO NOT let your dog urinate on the walkways, poles or bushes in front of the salon. If your dog poops please SCOOP and dispose of it in the provided bin. It is very normal for your dog to shake when coming into a dog salon. They are smart and know what is coming, and love to put on a “show” for their owners, but once inside they know the drill, and are quite content with us once the owner leaves. You are best to just “hand off” your dog and depart, otherwise your dog can sense your anxiety and it will be harder on him/her.